Proteins create quite the buzz within the natural hair community. Whether you love them or hate them they are necessary for your hair’s health. Hair itself is made out of the protein keratin. There are many types of proteins that can be of use for the health of our hair, but one of the most unique and interesting of proteins is silk protein. What is it? How can it benefit your hair? Where do silk proteins come from? , specifically, is extracted from silk. But where does silk come from? Well, this may sound a bit creepy, but it comes from insects. When growing, the larvae of a silkworm forms a cocoon made of silk that they create with glands within their bodies that secrete silk. 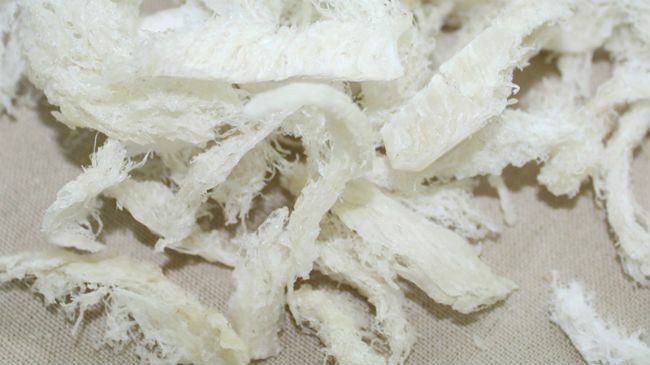 This silk is primarily made from the proteins sericin and fibroin. The amino acids that make up these proteins are then used in hair products. A silk protein performs the same primary functions on the hair as other common proteins, it helps strengthen the hair and helps to fill in the “gaps” between the hair cuticles to make the hair more resistant to breakage. But what makes silk protein so special? Silk protein helps to improve the shine of the hair while also adding to the hairs elasticity to prevent breakage. It also has great moisture binding capabilities helping your hair to retain moisture for longer periods of time. So, should you be seeking silk protein? If you find that your hair is lacking in luster, healthy elasticity and tensile strength then you may be in need of some products that contain silk protein. Have you tried one of these hair products containing silk protein extract?